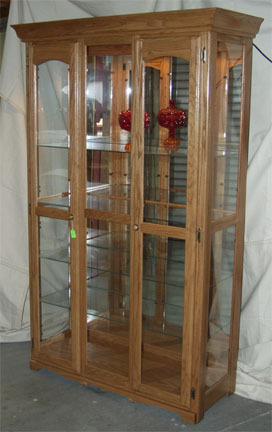 Clayborne’s presents solid oak framed lighted glass display cabinet. Handcrafted by the Amish like all of our other fine furnishings, it features two doors in the front, glass on 3 sides, 4 glass shelves inside, an interior light and a mirror on the back. The model shown is approximately 72” high, 36” wide and 18” deep. This display cabinet is a hit with our customers in the store during the holiday season, and Roger was eager to display it online for our web customers. This display cabinet will be a beautiful addition to your home, no matter if you use it to enhance your living room, dining room, den, family room, or even your kitchen, and no matter what collection of objects you choose to display. Everything will be safely tucked away from curious fingers, and it will pay for itself just in the time you will save not having to dust the contents! You may click below to see another photo of the cabinet with the interior light on - it is truly a sight to see. Why not let us custom build your solid oak framed Amish display cabinet today?